Something has shifted in the discourse of Israel since the Friday killings of 17 Palestinian protesters in Gaza, many of them plainly unarmed, by Israeli snipers from across a security fence: the hasbara– Israeli propaganda– is not working. The country has plainly done something indefensible. The usual defenders are silent, and the criticism from the left/center is stronger than ever. Senator Bernie Sanders’s sharp criticism is actually leading the U.S. discussion of the event. 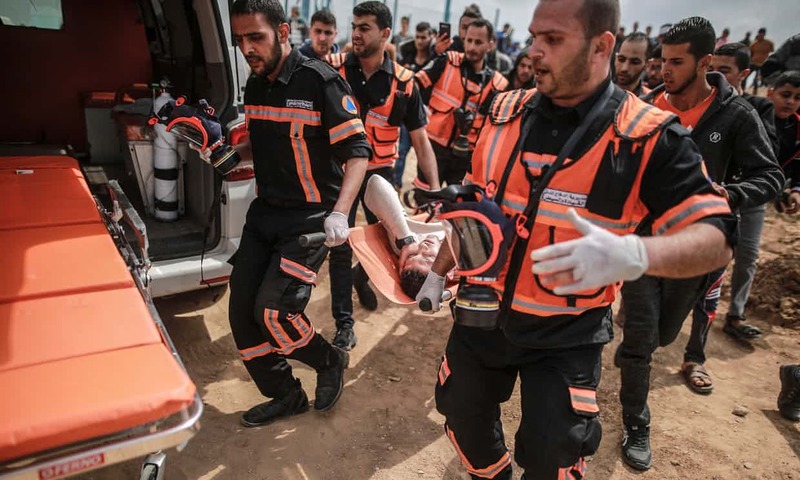 “National Public Radio” Morning Edition, the United States’s largest radio network, opened its news: Israel says it will not investigate the circumstances of the 15 Gaza residents killed in Friday’s clashes. Another propaganda achievement of the government whose army is the most moral in the world. “A pro-Palestinian narrative” is dominating international media, The Times of Israel reports; and fingers are being pointed throughout the Israeli government about who allowed Israel to be led into this PR “trap” by Palestinians. Michael Oren who can spin anything can’t spin this one. Michael Oren, for one, the deputy minister in the Prime Minister’s Office who is responsible for diplomacy, said Israel was patently unprepared for the crisis on the diplomatic and media battlefield, and that the word he was getting from abroad was that the Israeli narrative is losing “big time” to the Palestinian narrative. A crisis indeed. Usually-vehement Israel defenders in the U.S. are keeping quiet. They surely hope this will blow over. Bill Kristol has nothing to say about the killings. Neither does the voluble Bret Stephens. Jennifer Rubin has been silent on twitter. The liberal Zionist group Ameinu sent out a Passover greeting today with talk of the African refugees, but not a word about the killings. As for J Street– bupkus on twitter. Nothing on the blog either. Jacob Magid of the Times of Israel dismisses the effort by the Israeli government to justify the killings by saying the army identified 10 of the 15 killed as “Hamas activists.” As if “this in and of itself was enough a reason to shoot them dead,” he said. Gaza’s terrorist rulers make no secret of their agenda. They are out to destroy Israel. Suicide bombers, rockets, and tunnels have failed. So now it’s mass marches on the border. It is a sign of the discourse shifting that the Republican Jewish Coalition is now fastened on–Bernie Sanders. Violent, militarized “protesters” were attempting to cross the Gaza border fence, but @SenSanders would have the Israeli’s sit back and take it. That isn’t leadership, it’s cowardice. In an interview with CNN’s Jake Tapper, Sanders was asked if he accepted Israel’s version that most of the Palestinian dead were terrorists who directed attacks against Israel under the cover of protesters. “No, I don’t,” Sanders responded. “My understanding is you have tens of thousands of people who were engaged in a non-violent protest. I believe now 15 or 20 people, Palestinians, have been killed, and many many others have been wounded. So I think it’s a difficult situation, but my assessment is that Israel overreacted on that. Tharoor’s article is clear about the moral outrage here, and about the reason, Israel’s impunity. The Israeli leadership had reason to feel comfortable in its defiance. The most vocal criticism from abroad came from Iran and Turkey; censure from either country is more likely a source of relish for Netanyahu than unease. And at the United Nations, the Trump administration blocked the Security Council from issuing a statement that called for an “independent and transparent investigation” and affirmed the Palestinians’ right to peaceful protest. Top Israeli radio host Kobi Meidan has been silenced on Army Radio after posting on Facebook that he’s “ashamed to be Israeli” after 15 Gazans were shot dead during mass Gaza protests along the Israel-Gaza border last week. After talking with the media personality, Army Radio commander Shimon Elkabetz ordered the station to no longer broadcast Meidan on the air, but it remains to be seen whether temporarily or permanently. We will, of course, be closely monitoring the international response to the killings, including in official forums. But the media narrative is hardening, Israel went way too far. No wonder a local friend asked me yesterday, Has Israel lost its mind? Thanks to Ofer Neiman, James North, and Todd Pierce.